General Motors is funding the building of ten prototype hand cycles, designed by Michigan Tech, that wounded veterans will use to participate in marathons around the country. In an unveil at the Army-Navy Game this weekend, Chevrolet and students from Michigan Technological University showed a prototype hand cycle that has been designed to make it easier for wounded veterans to compete in racing events, including marathons. The hand cycle, designed by mechanical engineering students at MTU, is made to be stronger, lighter, and more portable than currently-available cycles on the commercial market. For veterans who are amputees or paraplegic, the hand cycle is the best option for racing and marathon running. GM's Chairman and CEO Dan Akerson says that GM will be building ten prototypes for use next year by the Achilles Freedom Team of Wounded Veterans in marathons across the country. This first prototype was used by retired Marine Corporal Joseph Woodke of Port Hope, Michigan, a racing member of the Achilles Freedom Team, as he cycled onto the field during the first quarter of the Army-Navy game. 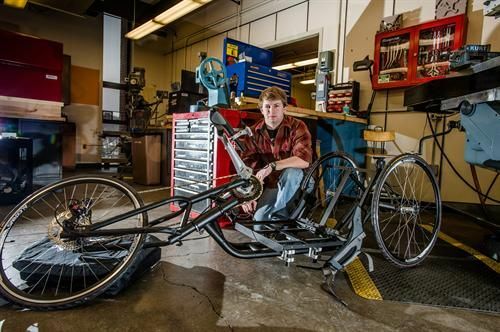 The cycles were designed as part of an MTU senior project called Huskies Helping Heroes, with resources from GM and engineering mentors from Chevrolet participating. Students spent time with wounded veterans from the Achilles Freedom Team to learn how they compete and learn the strong and weak points of the cycles they're currently using. From this, the design and eventual build of the prototype was made. The new cycle design uses high-strength steel alloys for durability, improved restraints for comfort and safety, and is more portable than currently-available options. It's made to fold and stow tightly, reducing wear and damage during transit, and the fold-down gives a more compact form to more easily fit in vehicles. In racing, the three-wheeled cycle design is much more ergonomic and stable than the traditional wheelchair design. A 3-wheeled cycle allows the racer to lean forward and pump the wheels with their hands, pushing their center of gravity forward on a stable platform and allowing for stronger, more sustained movement by the athlete. GM's Military Discount Program underwrites several Achilles Freedom Team competitions, in addition to supplying commercially-available cycles and a Chevrolet Silverado HD to transport them. “This is the most rewarding assignment I’ve ever worked on,” said Michigan Tech senior Brett Jenkins of Troy, Mich., who led one of the student engineer teams.